Yes, you read that title right. NOW is the time to buy. 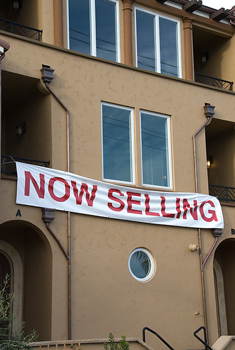 It’s true that the current economicy crisis has made many home buyers hesitant. They are nervous to purchase a home, understandably—No one knows what the future holds. But that doesn’t mean that jobs will stop relocating, that families will stop growing in size or that retirees will not want to downsize. There will always be reasons for people to sell homes, and for people to buy homes. A recent article in the Chicago Tribune discusses the perks to buying a home now rather than later. It mentions that many home buyers experience a “withdrawn bid” and end up turning down their dream homes at the last minute. According to Sid Davis, a real estate broker and author of “A Survival Guide to Buying a Home,” there are several reasons to buy a home now. First, you can purchase really nice homes for a low price! The economy is constantly in an up-and-down roller coaster, so why not buy now and hope that the next hill is going upward? Chances are, it will. This could be a premium time for investors to make some cash. Second, more detailed financial background checks are being given. In a positive light, this means that if you pass these background checks, you will receive a “pre-approval” letter that will mean more now than it ever has before. If you don’t pass the background check, at least you know the truth of the matter. You cannot afford this dream home right now, and you will not end up in a mortgage crises down the road. This gives you a chance to save up and know what you need to do in order to become approved. Third, so many people are selling homes right now. That means that the options available are endless! Jot down exactly what you desire in a home, and chances are you will find one out there that supplies just that. Check out www.buyowner.com to find the house of your dreams. For more of the Chicago Tribune article: click here. « Home Buyer: Storage Matters!